Jefferson James raised his daughter Jillian when her mother took off after her birth. Throughout Jillian's life, she learned nothing about her mom, and her dad was close-mouthed about his past. The two lived like nomads, moving often. Jillian could never make friends for she did not stay in one place long enough. "If you want to see the world, Jillie, you've got to rip off the rearview mirror and never look back." "Travel light. Pack nothing from the past, not even memories." "Never stay at a cheap motel. It marks you as a drifter." "Never give up too much information. It'll trip you up." "Always keep count or you might lose track of how long you stay and forget to leave." Jillian manages to collect enough money to go to Oklahoma City. Jefferson worked in the library's basement when she was young, and showed her a niche for them to hide things. She had stashed cash, her ID, and a letter in case her father searched for her. Seeing nothing was touched proves her father wasn't looking for her. Among Jillian's meager childhood possessions, she confiscated some old logs in which her dad listed their journeys. One page held a zip code that piqued her curiosity and brought her to Laurel Springs, Texas. Maybe someone would remember him? Jillian is determined to find out something about Jefferson then continue on her way. After all, this has been her life. She settles into a B & B and decides to get a job, applying to an ad posted at the local newspaper office. She meets Connor Larady, an introspective man a few years older than she, who happens to be the mayor as well as the editor. Surprisingly, the position is not with the paper, but Connor needs someone to keep an eye on Eugenia, his aged grandmother who owns A Stitch in Time, the quilting shop across for Connor's office. Eugenia is suffering from Alzheimer's, and Connor realizes she will not be able to maintain the business much longer. He hires Jillian to inventory and catalog the quilts which will be donated to a museum. "Jillian closed her eyes for a moment and took in a deep breath. She loved the smells of the quilt shop. Lavender soap left on the women's skin as they routinely washed their hands so no perspiration stained the quilt. Lemon wax on the eighty-year-old counter that had been left behind when a mercantile became the quilt shop. The smell of cotton, fresh and new, blended with the hint of dyes pressed into material. She even liked the scent of the oil on the hundred-year-old Singer Featherweight machines lining the back wall. Soldiers waiting to do their duty." Eugenia's warmth envelopes Jillian, and before long she feels part of this quaint town. The other quilters include her in their conversations, though somewhat standoffish understands Jillian will only stay until her work is done. She gets immersed in the historical tales of each quilt, and for the first time in her life, she is sad about leaving. As Connor opens up, Jillian experiences an attraction she cannot deny. Connor's surly and withdrawn teenage daughter, Sunnie, warms up, and Jillian finds herself surrounded by a camaraderie she's never had. 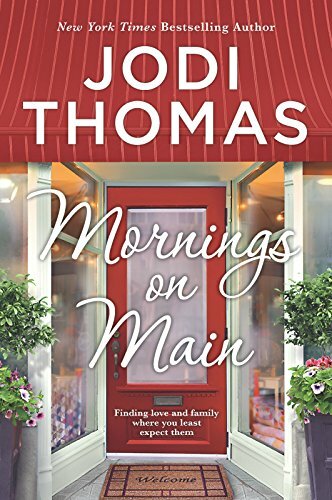 A sweet and gentle tale of finding love and oneself, Mornings on Main delves into the emptiness of being alone, the heartache of Alzheimer's disease, and coming of age. Some questions remain unanswered: Why would Jillian try to find a father who does not seem to want her? and Why would she insist on living a lifestyle without love or trust? Though the conclusion is satisfying, it appears to end too abruptly, having one wonder if this could be the first novel of a series.